Please note: Your The Melford Valley is currently closed. You can place an order now for delivery at a later time. Please check opening hours before creating your order. Please note: Your The Melford Valley is currently no Home Delivery available in your area. 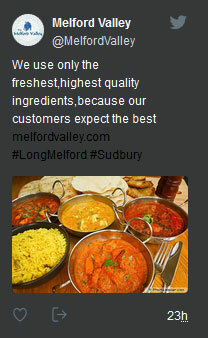 Please note: Your The Melford Valley is currently no Home Delivery available in your area. You can place an order and Collect from Store.